I reported in my last post (see here) why it is dangerous to rely fully on Gmail. I had promised to write how I managed to get all my e-mails in to Yahoo (as a back up). 1) I signed up for Yahoo. 3) It took about 24 hours for all my e-mails to be transferred (you will see the result after 24 hours – you will not see any progress in the mean time). In these 24 hours Google suspended my Gmail account a few times so be warned it might be dangerous. It is possible that Google / Gmail will temporarily suspend your service (it happened to me – see here) so please be aware of this. Google / Gmail does not want to see you take control of your e-mails. Pingback: GMAIL data recovery - no more problems in case of Google outage or Google deletion « anyone need my comment? I want to do the same thing. Do you think I should risk it? 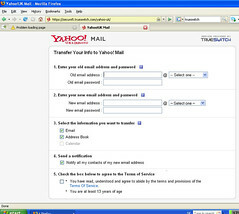 I thought about setting up Yahoo to download my email via POP using Gmail’s POP server. Oliver, personally I would do it again. But you have to know that Google is huge and if they do permanently suspend your account there is no customer service you can call to beg to unblock your account for you….